Now that Georgina had her mind made up, Serena Van Der Woodsen's life and sanity was just not safe. Hell hath no fury like a Georgina Sparks scorned! 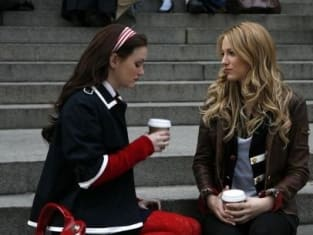 Gossip Girl Season 1 Episode 16 introduced all the mayhem Georgie was about to wreak on our Serena. It also focused on one of the side characters we haven't spent much time with: Eric Van Der Woodsen. If you thought Georgina's coming home presents were wild, they were nothing compared to the video she slipped Serena after a two week hiatus. i can remember watching this episode, being so desperate to know what was on that video, and FLOORED when Serena dropped that bomb at the end. Before I streaming online was even commonplace, I stayed up for hours trying to find "Woman on the Verge" aka Gossip Girl Season 1 Episode 17. Before we get to Serena's big bomb, there's the end of the Jenny/Blair feud. Let's face it, Jenny got lucky with some information that gave her a little bit of power but she was going up against a pro. Blair knows how to play, she practically invented the game. Little did Jenny know as she sat high on her Asher status throne that everything would unravel because of the one person she ever really could call a friend: Eric Van Der Woodsen. I would say that the moment I knew Jenny was gonna get taken down was actually when she accused Eric of having a crush on her. I was like "girl, you have truly gone too far." I don't know what it was, maybe the condescending tone she said it in just showed how darn naive she had gotten and I knew deep down she would get pummeled by the end of the episode. [to Eric] Oh my God, wait, do you have a crush on me or something? Don't be embarrassed, it's totally understandable, and not that unexpected actually. I'm flattered, it's just, my heart belongs to Asher. I've gotta go, but text me, okay? I approached the watching of this episode with the fact in mind that Dan is Gossip Girl. So if Dan was GG why would he out his own sister's boyfriend online and then refuse to print anymore until he got proof? Well, because he was smart (and ruthless.) Dan knew first he had to post on GG to get Jenny's attention, done. Then by demanding proof, he knew that Jenny would have to believe him. He went about it in a harsh manner, but he did it to ultimately protect his sister from getting more hurt in the end. Dan just didn't know that Jenny was so desperate for status that she would be a glorified beard. By far the best part of the episode was Blair showing up to Jenny's party looking flawless and subtly threatening Asher. The reason I loved it was because she decided she wasn't even going to go public with the evidence because she actually cared about Eric, unlike Asher. Then Eric turned up, came out of the closet with Blair's help, and they took Asher down together. Back to Georgina and the epic-ness of Serena's "I killed someone" confession...this was the Serena spiral everyone was waiting for. I did not in a million years think those were the words that would come out of Serena's mouth. How shocked were you by Serena's confession? Jaw on the ground. OMFG. I was shocked at how absurd it was! Please, this is the CW. Nothing shocks me! NOTE: Remember, you can watch Gossip Girl online at any time! I'm scared. I'm not as tough as it is, you know? Permalink: I'm scared. I'm not as tough as it is, you know? It's kind of hard to party after the gay bomb drops. Permalink: It's kind of hard to party after the gay bomb drops.